There are tons of different backpacks out there, different colors and different sizes. Today we are reviewing Caribee’s Thunder Bay 65 Travel Backpack. The Thunder Bay 65L is an excellent backpack for adults or college students who do not need to carry a lot of gear. It is not overly bulky when it’s full. Although we would like to have a few more internal pockets, we are very pleased with this well-reviewed backpack, which comes with a 2-yr warranty. Weighing approximately 7 lbs. empty, we started with few 7 tshirts, 2 jeans and 3 pairs of shoes – although it depends on an individual on how they are packing (folding clothes versus laying them), and then added some gadgets – iPod, iPhone (plus charger), 15″ Sony Vaio laptop, and finally some toiletries. Overall weight – approx. 30 lbs. The best feature of this backpack is the detachable day pack. While on the move, you can put all the personal documents, passport, currencies in this small bag and put it over your shoulder. No more dragging the big mother with you. Much like in a suitcase, this backpack opens up almost 70%. If you start folding the clothes and filling it, you can comfortably fill in at least 20 tshirts and 3 jeans, plus socks, napkins, toiletries and 3 shoes. There’s a shoe compartment at the bottom of the backpack which can be accessed from inside and outside. 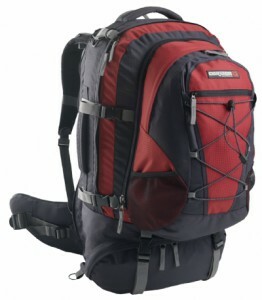 The backpack boasts an advanced back harness system which can be customized for your comfort. It also has a cover for the back harness which can be tucked in around the shoes compartment. We don’t recommend keeping your passport and currencies in the front pocket, but the front of the day pack has a string-space for a water-bottle and side pockets for snacks. While checking-in the bag at the airline, you would want to close the cover for the back harness. With the side shoulder strap and the top handle, it’s easy to pick this backpack up like a suitcase.